There is zero real evidence that anyone has dressed up as a Con Ed worker and gone door-to-door robbing people, yet the tales of such incidents are cropping up so frequently in media, on social networks, and old fashioned in person, that even Con Ed is warning people to ask its workers for ID. 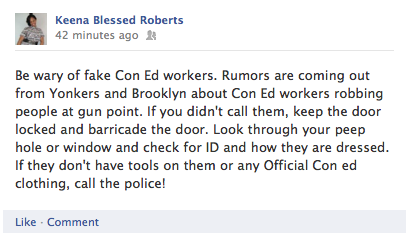 There is zero real evidence that anyone has dressed up as a Con Ed worker and gone door-to-door robbing people, yet the tales of such incidents are cropping up so frequently in media, on social networks, and old fashioned in person, that even Con Ed is warning people to ask its workers for ID. The Wall Street Journal's Speakeasy blog spoke to one Lower East Side resident who said the doormen in his building told them they were checking IDs because of "incidents" near by. Not a single police officer or Con Ed official has confirmed the claims, which involve a series of tweets, a Facebook post, and one interview in The New York Post with a Brooklyn cab driver, Eric Martine, who maybe saw these crooks in person (but if so did not apparently pass on many details to the paper): "Guys were looting, pretending they were Con Ed and holding people up. It was sick." And that is the closest thing we could find of eyewitness or official confirmation of the Con Ed burglars menacing New York. We'll go over the less impressive evidence below, but the lack of fact has not stopped that one building from upping its security, or the rumor from spreading far enough for Con Ed to send out the following tweet to calm people down. The story of criminals disguised as Con Ed workers predates Sandy. Last June, "Neighbor Max" told the Ditmus Park Corner blog about fake Con Ed employees coming to his door. He didn't mention guns or theft, though. It's not unbelievable that people stealing things would dress up as Con Ed workers. Man-Hole thieves were described as looking like utility workers earlier this year. So it's possible these incidents put the idea out there. Whatever it was, the first warnings about thieves impersonating Con Ed workers were issued within hours of the storm. The earliest tracings of the rumor that we could find emerged at some point on Monday night, just after the power went out in New York City, with some people talking about it on Twitter here (8:53 p.m.), here (10:52 p.m.), and here (11:47 p.m.), to give some examples of the smatterings we found. Two of those claims were that the fake Con Ed workers were robbing people in Yonkers, which is a city north of the Bronx. The next day, the idea picked up and moved south to Brooklyn. The Satmar Headquarters Twitter account, which appears to be focus on news affecting the Hasidic community in Williamsburg, tweeted the following 5:17 p.m..
That same exact message made its way to bigger names, like DJ Josh Madden (a former Good Charlotte band member) at 8:51p.m. that same night and from Worldwide Actions at 6:15 p.m. earlier that day. By that time, Bloomberg social media editor Jared Keller noticed the Madden tweet and debunked it on his Tumblr. "Boom. Lawyered. The Twitter truth machine told me what I needed to know," he wrote after hearing from his trusted Twitter friends PBS's Beth Ponsot and Digg General Manager Jake Levine that the thieves-as-Con Ed-workers thing was made up. That conventional Twitter knowledge, however, didn't stick beyond his circle. He later got a text about the same possible hoax. As of 10 p.m. Monday night 1,374,312 New Yorkers didn't have power, tweeted governor Andrew Cuomo. The rumor continued making its way around Twitter and Facebook in various forms for the next two days. From the many retweets we found, it looks like a tweet from Tony Touch, a Brooklyn DJ with over 50,000 followers exacerbated things. At that point, Twitchy, a site run by Michelle Malkin that basically aggregates Twitter, picked it up, calling the rumor dubious. Yet, that didn't stop it, either. Once the Post article went up early Tuesday morning, it went beyond Twitter to the Daily Mail and onto other blogs. Shortly after Martine's supposed sighting in the Post, which went up at 12:39 a.m., the Con Ed tweet went out, at 2:52 a.m. Now, it's off the Internet and into the real world. A day later, we hear about doorman talking up supposed "incidents," even though all Twitter signs and the lack of total evidence point to: Not true. There has been a lot of talk about Twitter as the "truth machine" during Sandy. "Twitter's capacity to spread false information is more than cancelled out by its savage self-correction," wrote Buzzfeed's John Herrman. That was true—for some false information out there: Twitter helped out all the fake Sandy photos going around for example. It also ousted the spreader of false rumors @ComfortablySmug. But, for some reason, this is the rumor that got away. Twitter debunked it—or at least some reliable tweeters did. Yet, it still made its way outside of the social media world and into our consciousness. Not only is the Twitterverse still running with it—we found whisperings as recent as two hours ago—but it's so pervasive it has seeped into the neuroses of in real life people. It makes you question: Among all the rumors, why this one?